Drying your nail polish always takes longer than you want it to, especially if you're in a rush to leave the house or perform a daily chore. However, there are some methods you can undertake to hurry the process along and help you get shiny, dry nails in an instant. Icy, cold water is renowned for setting a manicure fast. Before you start painting your nails, grab a small bowl and put in a handful of ice. Fill up the bowl with ice cold water and insert the tips of your fingers until your nails are completely covered. Hold for one to two minutes before releasing your fingers. This method is one recommended by Prevention Magazine, however, some women who have used this method found the ice water was too cold. Applying cold air from a hairdryer to your nails can ultimately speed up the drying process. Hold your hairdryer six inches away from your nail beds on a cold setting for about one minute for maximum results. However, try not to hold your hairdryer too close as it can cause the polish to bubble or ripple. This method is recommended by NYC manicurist Liang, who suggests using the cold shot button (if your blow dryer has one) for best results. A traditional method for drying nails quickly is to apply a top coat that has fast-drying properties. This also helps to strengthen your nails. For instance, Seche Vite Fast Dry Top Coat (about $6) protects nails from smudges, dents, and scratches for a speedy manicure. You can use baby oil, sunflower, or olive oil. Nails Magazine suggests that some natural oils can work well as drying agents. Coating the nails in oil will make them dry quickly, as well as hydrate your hands. Fill up a small bowl with enough oil to be able to coat your nails as you dip them in (about one cup). Leave your nails soaking for approximately four minutes and then wash off the excess oil (or wipe off with a paper towel). You're left with dazzling, dry polish. Air dusters release a cooling spray that has special heat absorbents, which can effectively reduce your nail drying time. According to Physics Buzz, methods like this that lower the temperature also lower the vapor pressure of the nail polish, which allows it to dry more quickly. Purchase an air duster from your local drug store. Place a paper towel under your hands before spraying the air duster over your nails for around three to four minutes. Do not hold the compressed air too close to your nails. Wash your hands afterwards to remove any excess product. Allow the natural elements of the outdoors to work their magic by holding your hands out of a window for a few minutes. It helps if it's cold outside, as nail polish dries faster when it encounters cooler temperatures. Using cooking spray is a popular tip for speeding up the nail drying process. It also moisturize your hands. Simply lay some paper towel down underneath your hands and then grab some cooking spray. Spray the product directly onto your nail beds generously. Afterwards, remove any excess oil by washing your hands with warm water. Specialized nail drying agents contain solvents that evaporate fast. As these solvents evaporate, they take the liquid from your nail polish with it. Paint your nails as normal and then apply a product like OPI's Drip Dry (just under $23) lacquer-drying drops or Essie Quick-E Drying Drops (about $10). Alternately, you could apply a nail-drying spray, like Up & Up Nail Polish Drying Spray (about $3) over your polish. Allow 60 seconds before resuming your day. This is a quick and easy hack for drying your nails faster. Salon owner Nick Penna suggests hair spray as quick-fix method for nail drying. 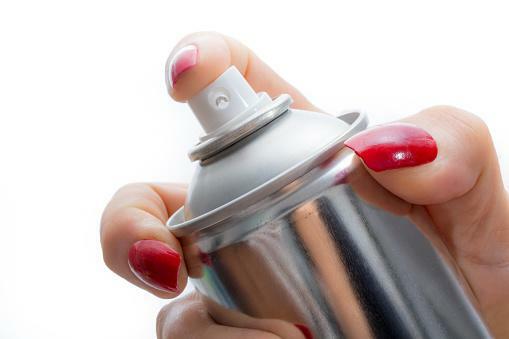 Grab a bottle of aerosol hairspray and spray the product onto your nails once you've applied your polish from about six inches away. Wait for one minute before washing the product off with soap and water. Voila! According to manicure expert Danielle Candido, applying thin coats of nail polish is one of the best ways to help nails dry more quickly. She also suggests waiting two minutes in between application to ensure the coat of polish is fully dry. Wet nails can be a problem if you're in a hurry to get on with the rest of your day. However, the above methods are straightforward to implement and only take a few minutes to generate results. Experiment with different options to find the one that suits you best, and then look forward to achieving beautiful, dry nails fast.